Oh, great. Someone else thought basing a kid-friendly animated special on a romantic Christmas song was a good idea. Okay, first let’s be clear. I actually like this song. It’s sappy as heck, but it’s bouncy and fun and easy to sing. But it is clearly about a lover. Not a dog. I mean, we love pets and all, but this is a bit much. The special is based on Ms. Carey’s book of the same name, also based on the lyrics to her hit song. 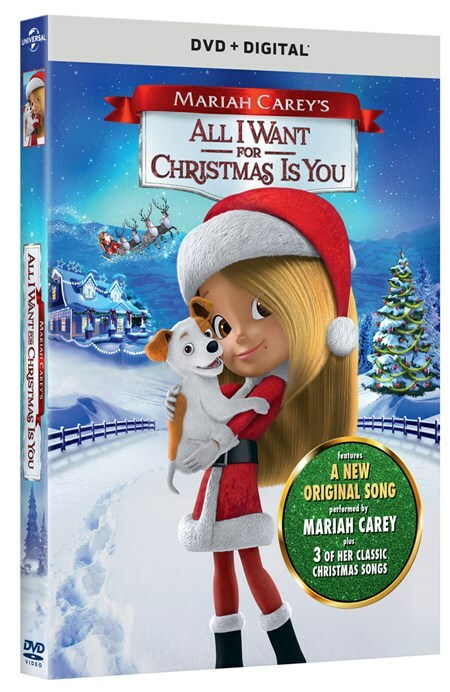 It’s about a little girl named Mariah and her Christmas wish for a puppy. The Mariah of the special has some things in common with the actual Mariah, but this is clearly much more fiction than memoir. Anyway, Mariah wants a puppy more than anything, but her dad is allergic and her mother is a neat freak. Her grandmother brings her to the pet store, however, and introduces her to a dog. Quickly dubbed “Princess,” this dog is small but no longer a puppy, well-trained and hypoallergenic. Mariah begins an all-out campaign to convince her parents to let her adopt Princess. She even agrees to be in a dog fashion show with some girls from school because she’s so sure she’ll have a dog soon. It’s a week or so before Christmas, and her dad comes in one night with.... a puppy! Not Princess, a scrappy dirty little guy called “Jack” that he says was recently adopted by Mariah’s uncle. If she can dogsit Jack until the holiday, her parents imply that she can adopt Princess. What confused me the most about this was the parents shooting themselves in the foot here. You had an opening to make your kid happy with a calm, trained dog, and you opted for the untrained one who is going to steal your food, eat your shoes and wreck the house? Jack is nothing but trouble. He messes up everything, he howls along with a chorus concert, he gets off-leash and knocks over the principal, and generally makes Mariah’s name mud around town. He pukes at the fashion show rehearsal and knocks over a bunch of decorations at a (strangely outdoor) toy drive. There's a whole side plot about how her grandfather is trying to sabotage their neighbor's outdoor lights, but I don't want to get into how dumb that was. Mariah is determined to get Princess, so she sticks with Jack, and even manages to train the little guy a bit. She also learns not to be too angry with him because he’s too young to know better in most cases. Things come to a head when two squirrels get into the house late at night and destroy the living room, but Jack is blamed. Mariah is so fed up with him that she doesn’t notice until later that he’s gone. Heartbroken and guilty, Mariah is distraught that she lost him. Her dad comes clean around this point, confessing that Jack was a stray that he took in hoping he would be so much trouble that Mariah wouldn’t want a dog anymore. Seems like a mean thing to do to both a kid and a dog, really. They all go down to the pet store before closing, where another kid is looking longingly at Princess. Mariah declares that the only dog she wants now is Jack, and sets out to look for him. Cue the song! This first verse is super awkward in that kid-voice-actor-doing-an-adult-woman-sultry-song-style thing that I personally hate, but once the tempo picks up, it’s fine. All Mariah’s friends and neighbors turn out to look too. A side note here: We don’t have to worry that Jack has been hit by a car, because in the entire hour and a half movie, we saw two cars. TWO. Just loads of empty streets without cars, through this whole thing. It was weird. She finally finds Jack in among the toy donations (he had been obsessed with the smell of the stuffed animal she donated earlier), and they are reunited. This isn’t as bad as it should be. The animation is okay for direct-to-video cheap stuff, the voice actors are doing a serviceable job, and the writing, while obvious, isn’t often idiotic. We laughed a lot about the lack of cars, and the music is okay, despite the odd choice to try to make the main song about a girl’s love for her dog. However, in the end it isn’t better than mediocre and bland, so I can’t give it a pass.